Astrological charts can be a useful tool to gain an insight into a range of topics including aspects like your personality, relationship or what are the themes for your upcoming year. I am often asked about the Star Signs included in newspapers or the simple coffee-table books on astrology. Unfortunately, Astrology is more in depth then the simple star signs you see in your local newspaper or on TV. These astrology snippets are very generalised and do not take into consideration your entire astrological chart or make up. They only seem to focus on a very generalised Sun Sign, or your main astrological sign. This is why these superficial astrology books are often not looked upon favourably by anyone that has studied even the simplest astrology. They are an excellent starting point for people interested in learning astrology, but only barely skim the surface of this topic. A full Astrological chart is made from your date of birth, the time you were born and the exact location of your birth. These variables will change the position of the planets in your chart and impact the outcome, reading or summary presented. If you would like a FREE ONE PAGE Astrology Chart – Sign up for my e-mail mailing list and I will e-mail back an accurate Astrology Wheel specifically for you! This includes your zodiac sun sign, the planets in our solar system and their associated signs, your rising sign (if you supplied your time of birth) and the graphic wheel. You can then use that information to start researching your own astrology chart and exploring how each planet may impact your life or surroundings. Sample Basic Astrology wheel for Whoopi Goldberg! A brief introduction to the concepts of astrology. Life Goals – the Sun and Jupiter. Education and Communication – Mercury. Creativity and Originality – Uranus and Neptune. Challenges in Life – Pluto. Purpose and Joy – The Ascendant (or Rising Sign). With every INITIAL Esoteric Acupuncture consultation the full 20+ page Natal Astrology report is included as an added bonus for FREE. Click on the image above for a FULL Sample Modern Report! 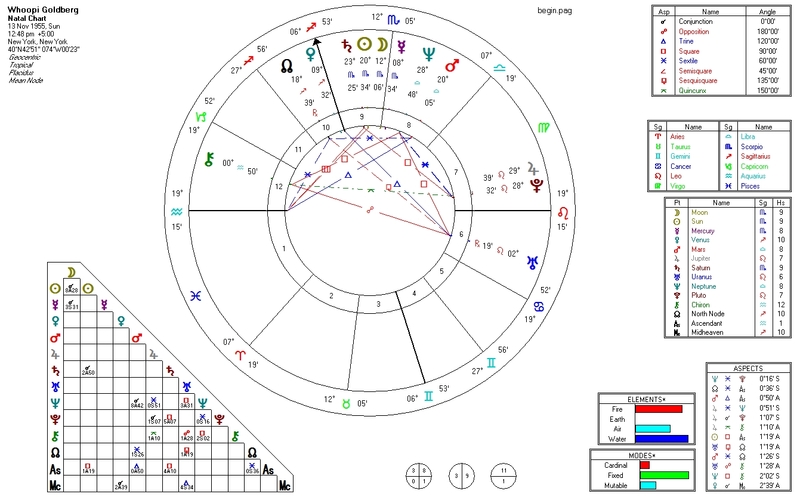 An Introduction to Solar Returns explaining the concept of an annual forecast birthday chart. With every FOLLOW UP Esoteric Acupuncture consultation a 20+ page Solar Returns Astrology report is included as an added bonus for FREE. Click on the image above for a full sample Solar Returns Report! Both of these reports have been created so that it can be easily understood by both the general public and astrologers alike. Professional astrologer Stephanie Johnson has designed and wrote the reports with illustrations by artist Janet Bridgland.